This is a A5 card that I made for a Confirmation. I have used a lavender pearlised card, and added layers of Spellbinders frames, Radiant Rectangels, Opulent oval, and Fleur des lis. 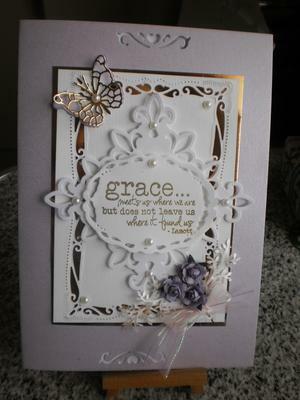 The sentiment Grace is from Verve stamps and I embossed it in Gold. I added a butterfly by Marianne and purple roses and a bow. I hope that you like and hope that it will be appreciated by the recipient. The recipient is going to love and not just like this card as it is really lovely. 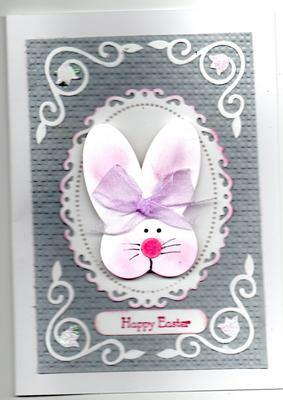 The particular dies that you have used are some of my favorites and the card will always look good with layers. I also like the mirror card that is in the background as it glows around the centrepiece and draws they eye towards it. I was asked to make a birthday card with hearts and it had to be an easel. So I got the idea from Christina and made it a little different. 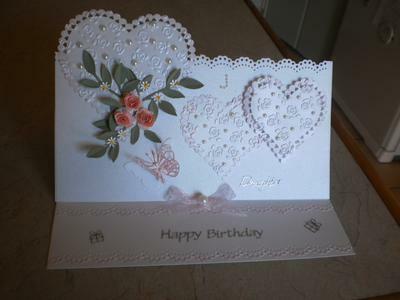 I used white pearlised card and used heart die cuts from my Nellie dies. I added pearls to the hearts and a ribbon bow at the bottom to enable the easel to work. I added peel offs for the sentiments and added a computer generated verse inside. I also added the initial J for the daughter's name in pearls. This is so pretty and the pearlised card makes it look really special. I like the fancy edge to the top and your flowers look so delicate. For me flowers always make the card look really feminine and I have never had anyone say they don't like them. Just wanted to share my little Easter bunny with you. This was made using punches and I dabbed a little pink colour to his cheeks and ears and added a bow. I then adhered with dimensionals onto a Spellbinders fancy oval and then on to a grey background that I ran through the Cuttlebug in a Lattice Embossing folder. I then added some corners that I had cut out. My friends saw this and wanted me to make them one for their grandchildren. Very cute and isn't it amazing what a few punches and shapes can create. I am sure that any child would be delighted to have this card and will probably save it for quite some time. There are lots more ideas for this type of card in the Novelty Cards section and you will find that in the NavBar to your left. I saw Christina's video on the Spellbinders Poinsettia and had to have a play. I made the flowers and leaves and adhered them to the Enchanted Labels which I had stamped with an old stamp of PSX. I added a bow then adhered the whole lot to Gold Mirri card and then put it all on an A4 Pearlised card. Now I have made my first Christmas card this year. The busy season for card makers is about to be upon us and so making an early start on your Christmas cards is always a good idea. The traditional colors of red and green can be used but do also consider using the paler choices of cream and pastels coupled with gold and silver just like Janet has done here. This will give you a luxury look to all your cards and both you and the recipient will be delighted with the result. 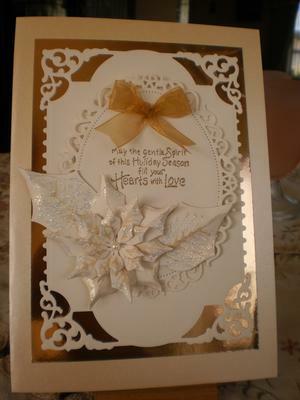 And of course using the Spellbinders to create the embellishments will enhance that card too. The Poinsettia is such a useful die to have in your crafting "Stash" and it is a symbol of Christmas that we all know. But don't forget that it can be used all year round and so give you your monies worth from its use.